While I won't tell you that every detail in this story is true, I do give you my word that there is truth in this story. You see, this is a thirty-year reflection of a ten year old brain, and all I can offer you is an account of the way I remember it. My Grandpa Shepherd was named Harry. While he had great hairy arms, and a silver-haired chest that burst from his v-neck Fruit of the Loom t-shirt, his jet-black hair on the top of his head was a bit scarce. While I wouldn't say he was bald, his hairline was like the current Russian economy, in deep recession. Grandpa Harry was a World War II veteran, had a big green tattoo on his bicep to prove it, had an old Coke machine filled with cold bottles of soda in his garage, and smoked like a chimney. He kept his Pall Malls in the glove-box of his old Datsun car, and he'd send me out to retrieve them for him... much to the dismay of my mother. Contrary to popular psychology, this did not make me a chain smoker. While I don't care if you smoke, I think they're too expensive and generate bad breath. ...he picked up the apple like he did so many times before and he polished it against his shirt until it reflected the sunlight. He opened the larger of the two blades of the knife and began by pressing the blade into the top of the apple, near the stem. The knife would crunch through the skin and a fine mist sprayed out, visible in the dusty rays of the sun. The knife remained in a solid, stationary grip in his hand while he rotated the apple. The knife made a wet, crunchy sound as it slide through, creating a single long spiral that fell to his lap. He handed it to me and like always, I held the empty skin in my hands, and marveled at how it could be formed into its original shape, a perfectly formed apple, that was nothing but a red shell. I looked up to see him smiling and chuckling at me while he held up a perfectly peeled, pure white apple. Like every other time, he sliced the apple, bringing the blade through it to his thumb, and together we ate the best tasting apple the world had to offer, always crisp and juicy. But this day would be different that our normal routine. Instead of folding the knife and placing it back into his faded boot-cut jeans pocket, or using it to clean his fingernails, I was surprised to see him holding it to me. 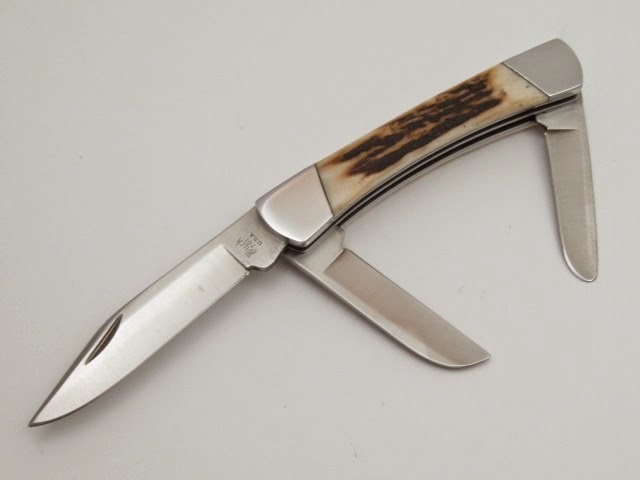 "Chad, you know I've carried this knife a long time. I even used it to skin a bear... inside-outwards. It's a good knife, and I want to give it to you." I wasn't sure what I felt in that moment, but I remember being surprised by the gesture. I accepted the knife and quickly shoved it into the pocket of my chunky boy jeans. The problem with this story is that I was ten years old, and I had a ten year old brain. "The Transformers! More than meets the eye! The Transformers! Robots in disguise. Autobots lead their battle to destroy the evil forces of... THE DECEPTICONS!" Mom liked to shop at a department store called, "Hills." Hills had a full aisle of Transformers and every time I'd go in there, I'd salivate at the sight of them. Now, my parents loved me and I knew I could score one or two for Christmas, but I knew one wouldn't be going in the cart any time soon. Preston Brewer was a friend of mine that I'd met in our small town at the Camden First Church of God. Preston's family lived in the village of Jacksonburg, population 84, in a perfect little wooden A-frame house. Preston and his whole family wore perfectly pressed button-up collared shirts and shiny shoes. And Preston had a bedroom full of Transformers. But what Preston lacked was a pocket-knife. I showed him mine at church and his eyes lit up. Preston told me that his dad wouldn't allow him to have a pocket-knife, but he really wanted one. At that moment my brain conceived a magnificent and perfect plan. I would just have to play my cards right, and I'd have a Transformer to take to school on Monday. And so, I immediately put my plan into action, arranging for my afternoon to be spent at his house. I kept my plan private, riding in his families immaculate car to the little burg that held his pretty little house. I minded my manners and made sure I ate everything on my plate. When dinner was complete, our napkins property folded and our fork and knife placed in an x on top of the empty plate, we were dismissed from the table and we went up the stairs to his room in the peak of the house. As Preston ran to the shelf to take down his transformers, I reached into my pocket and took out the knife. When he turned around with Optimus Prime and Megatron, I was shining the blade on the top of my jeans like I'd seen Grandpa Harry do so many times. Preston stopped in his tracks. "Can I see it?" I paused and looked concerned before saying, "well, I guess... yeah, sure." I showed him how to open and close it safely, how to keep it shiny, and how to always be sure to cut away from your self, never carving towards yourself. I waited for it... and then I knew the deal was sealed when he said, "man, I'd love to have my own knife." He took the bait and I pulled up hard on the line... this was the moment! "Ya know, maybe we can make a trade." He looked up with big eyes and said, "no, my dad would never allow it." I immediately replied, "well, my dad won't buy me a Transformer, and I think me and you can just make a deal." Preston was more savvy than I anticipated. He was willing to make a deal, but he wasn't as desperate for a knife as I was for a Transformer. 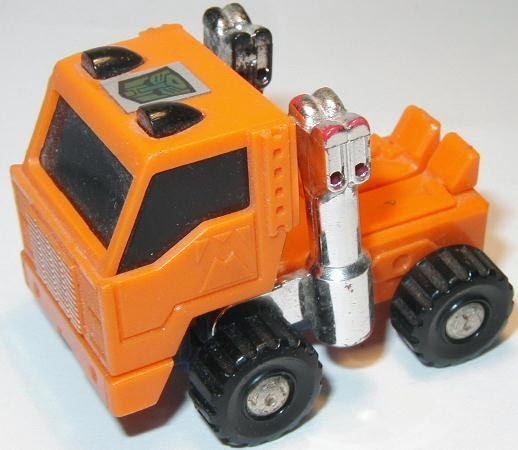 Before I knew what was happening, I had been negotiated down from Optimus Prime, a large silver, blue, and red eighteen wheeler truck that stretched across the whole table, to a small orange and blue truck with a broken smoke-stack. At first I was frustrated and disappointed. But I held the truck in my hand and looked down at the Autobot sticker on the top of the cab. I could hear the Transformers theme song playing in my head. I could picture myself playing with it by the Big Rock in the West Elkton Elementary school yard with my buddies Jerry Schul and Kevin Dyehouse. At that moment I knew that I had to have it! I said, "DEAL!" shook his hand, and the trade was complete. Huffer was mine, and life was good. Life was very good. In fact, life was perfect. I took Huffer to school and I was able to play Transformers with Jerry and Kevin. 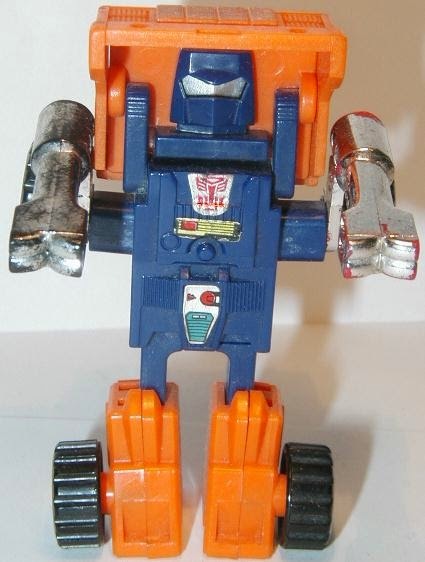 I came home from school and held Huffer in my hand while I watched him on television and sang "TRANSFORMERS, ROBOTS IN DISGUISE" at the top of my lungs. Life was perfect for exactly three days. It all ended on Wednesday evening when my dad said, "let me see that knife." To this day I don't know if he somehow was aware of my covert deal, or if it was just a chance question to pass the time, but I remember my blood freezing and my heart exploding in that moment on the couch. I didn't dare lie to my father, and so I had to find the perfect answer to divert his attention and get myself off the hook. I thought of the perfect answer, "I really don't know where it is." It was the perfect most brilliant response to my ten year old brain! My dad didn't see the brilliance of my response. Instead he replied, "go find it." And so I decided to 'fess up. I muttered to him with downcast eyes that I had traded Grandpa's knife for the Transformer in my pocket. I showed him Huffer and he saw that Huffer had a broken part. He shook his head as he said, "so you traded your Grandpa's knife for a broken toy." I felt regret sweep over me as I allowed myself to accept the ridiculous nature of my action. I wanted the idea of owning a Transformer so badly, that I had been willing to pay any price. I'd given away the heirloom of my Grandpa for a broken piece of plastic. Dad picked up the telephone and had a conversation. He told me, "get your coat and bring that toy, we're going for a ride." I knew the back roads well enough to know we were driving to Jacksonburg, population 84. I wondered if now it was population 83. We pulled into a local pizza joint, Marcum's, and I saw Preston's family car. We walked into the shop and I saw Preston and his father standing at the back of the shop. I glanced at his father's face. Our dad's had the same unhappy expression of disappointment staring down from their faces. It was like a scene from a movie with the mob on one side and the fuzz on the other. Preston and I slowly walked to the dead zone in between. Without making eye contact I lifted Huffer out of my pocket and took my knife back in my hand. The exchange was made and I looked up at Preston, we both quickly glanced away. I walked back to my Dad and we went back to the car in the silence of that dark Ohio evening. I'd survived. I considered all that had happened, and I leaned back against the seat with a sigh of relief. It was over. Life again was good. Until suddenly again it was not. We passed the turn to our house. Dad kept driving and I felt dread grip my heart again as I realized where he was taking me... to a place that normally generated happiness in my heart, but now filled me with dread. I knew that I had wronged my Grandpa, and I was being taken to face him. I remember that small living room. The last time I had been there it was filled with sunlight and a bright red apple. I felt special and loved. But this time the room was dark with the static filled light of the television blinking out towards me. My dad said, "you know he traded that knife to a kid for a broken toy." My mouth suddenly was dry and I gulped. Grandpa Harry turned to examine me as I stood there exposed. He said, "you traded it for a toy?" All I could say was, "yes." He said, "do you have it back?" Again, "yes." He nodded and responded, "well then, let's see it." I dug the knife out of my pocket and handed it back to him in sadness. Through my own bad choices I now had lost both Huffer and the knife. I watched him take it into his hands and examine it with an easy familiarity. He opened each blade and cleaned them against his jeans. He looked and regarded me for a moment in silence. He took a breath and said, "do you think you'll trade it away again?" I said, "no." He said, "I gave it to you because I want you to keep it." Again with the one worded answer I said, "yes." And then he reached out his hand, extending the knife back to me and said, "so keep it." Life again was good. In fact, life was now perfect. My Grandpa had given me exactly what I needed. I thought I needed a Transformer. But what I really needed was something worth far more in value. It was exactly what he gave me. He gave me love, grace, and forgiveness.